Garstang FC booked their place in the first round of the FA Vase thanks to a 2-1 win at AFC Darwen. 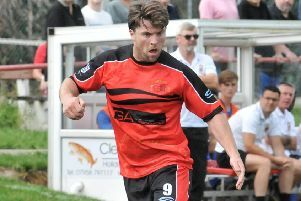 With Kieran O’Connor not recovering from the injury he picked up at Holker and Josh Westwood out long term, Lee Baker used Ric Coar as an emergency centre-half – and it turned out to be a good decision. Garstang had an early opportunity but Billy Akrigg was unable to get his foot around the ball, striking it wide of the target. Cam Ross headed an Akrigg corner well wide and, at the other end, Darwen had the ball in the net on 13 minutes but it was disallowed as the ball had gone out of play before being crossed. Garstang took the lead a minute later when Ben Roberts got clear and rolled the ball to Jake Salisbury for the simplest of finishes. On 24 minutes, Salisbury cut inside two defenders before planting a left-footed effort into the back of the net for his second of the game. The second half began with a setback when a shot came back off the post and Matthew Farnworth was on hand to convert the rebound. It could have been 3-1 two minutes later when Shaun Sailor drove from his own half to the edge of the box, only to be denied by the keeper. The home side saw more of the ball but it was Garstang who had the better chances without being able to put the game to bed. Darwen pushed forward but Coar continued to win every header, Tom Graham broke up play in midfield and the only real chance Darwen had was a looping shot which Will Kitchen tipped over. After a nailbiting six minutes of added time the referee finally blew the whistle and the Riversiders made history. Garstang FC have another away day ahead of them following the draw for the first round proper of this season’s FA Vase. Victory at Swallownest would see the Riversiders pocket £825 from the competition’s prize fund with another £275 going to the losing team.